Cold Weather Jeans Skil’s Updated XBench: Simpler, Better? We’ve covered products like Stanley’s Panel Carry and the Gorilla Gripper that make carrying sheet goods easier — now we can add JHandles to that list. 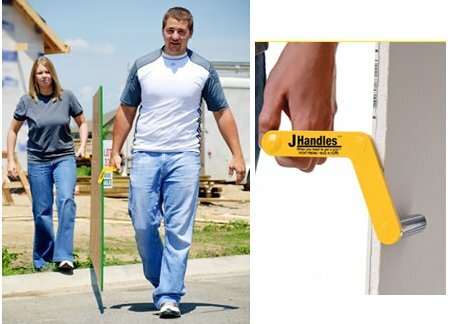 Besides sheet goods, JHandles can also be used to carry furniture, prefabricated panels, and other hard-to-handle items. The solid steel JHandles, which come in pairs, weigh 2.2 lbs. per set and can be used to carry up to 200 lbs. Because of their symmetrical design, they can be used either left- or right-handed. Since they attach to the edge of the sheet, they are in a more natural carrying position. The best deal I could find was $29 shipped from the JHandle’s corporate website. Sears and Amazon also sell them for $30, but charge additional shipping. I’m I the only one that thinks that these might be a really bad idea for toting drywall? That was my thought the second I saw it. Couldn’t you just make this with three 10mm bolts and a bit of plywood? It’s simply three pins in a bit of plastic. yep, these would go through drywall in a second as soon as you heft it up. But…with flat surfaces gripping the panel, maybe even that rotate on the existing shafts, not only would there be more friction for carrying heavier pieces, it wouldn’t go through drywall…or do damage to softer/thinner pieces of wood, either. $199 for the two flat panel clamps on Amazon! Ha! Guess I would make a fortune if I made them better and sold ’em for $99 instead. Hard to beat that plastic Stanley panel carry for under $10, really. Wouldn’t trust these for carrying drywall at all. Poorly designed in my opinion. Should have flat surfaces contacting the material to avoid breakage or damage. Easily duplicated as-is. With a G clamp,i can take a sheet of ply onto a roof by myself. Try that with these. i don’t how long these have been around, but i saw something similar about ten or fifteen years ago. the tool i copied had a t-handle. the only caveat if you do use them…never lose tension between your load and the pins. Well actually I have a set of these and they work GREAT! There is NO damage to the drywall at all and they do exactly what I was told they’d do! I’m very happy with my JHandles and recommend them to everyone. And the Stanley panel carrier just breaks after to many times of use.